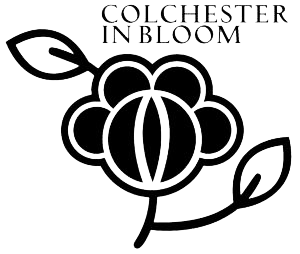 Henry Collins (1910-1994) and his wife Joyce Millicent Pallot (1912-2004) met at the Colchester Art School in 1932. They married in 1938 and began working on public art commissions together in 1948. They completed over 60 projects in a pioneering partnership that lasted over 62 years. They are perhaps best known for their work on large-scale concrete murals during the 1970s many of which remain on show today across the UK. 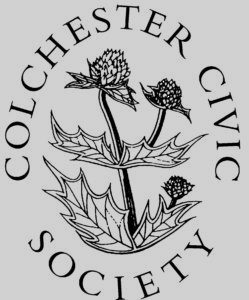 They were founding members of the Colchester Art Society in 1946 and lived and worked in Colchester for most of their lives. 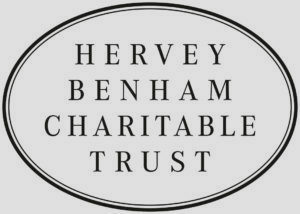 Henry taught at St. Martins School of Art and Colchester School of Art and Joyce at Colchester and Southend Art Schools. Their first prominent commission was for The Central Office of Information for the Sea and Ships Pavilion as part of the Festival of Britain in 1951. Following this they exhibited internationally developing designs in Formica for the Brussels Exhibition (1957-8), Jamestown Festival, USA and Expo 1970 in Osaka, Japan. They enjoyed great success in commercial design, working for Max Factor, KLM, Kodak and the GPO. 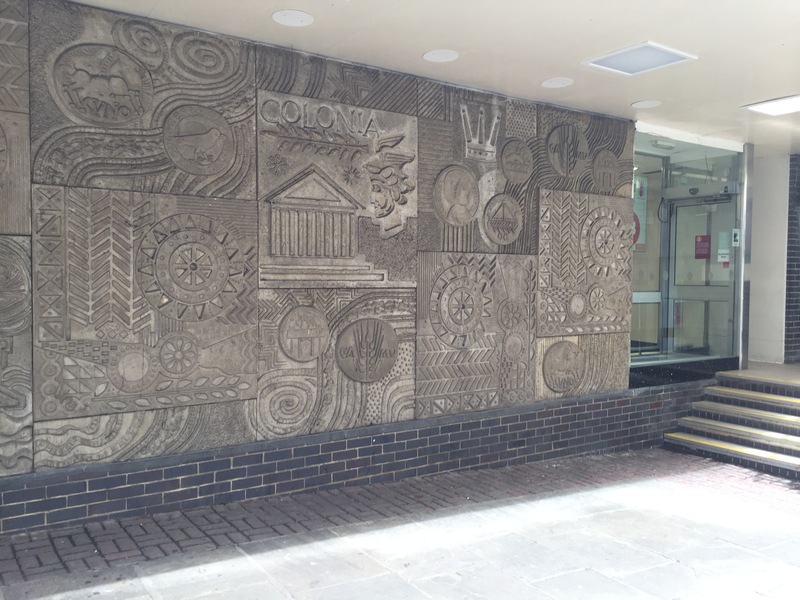 Their first mural in concrete was commissioned as part of a new store development in Colchester town centre in 1969. Stanley Bragg Architects were designing the new Sainsbury’s and approached the artists to make a mural for the store’s facade. The first in the country, it is still in situ today and comprises 24 separate panels all made in concrete. This example of arts patronage set by Sainsbury’s was innovative, imaginative and exactly suited to the couple’s philosophy. They responded to each invitation by developing detailed background exploration. Joyce undertook rigorous historical research into the site so the designs had a strong sense of local place – whilst Henry took the lead in drawing and designing them. The importance of the process and production of a work and its relationship to its context were to become the hallmark and signature of the couple’s partnership. 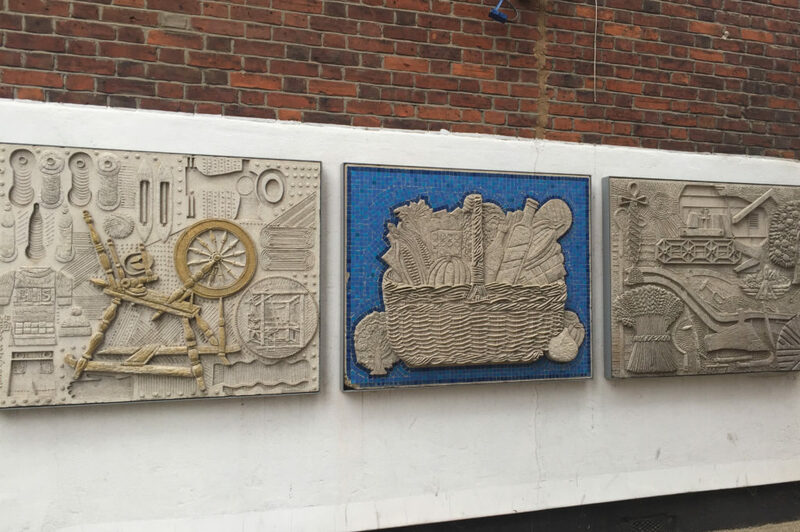 They were commissioned to make over 30 public murals across the UK throughout the 1970s and into the early 1980s. 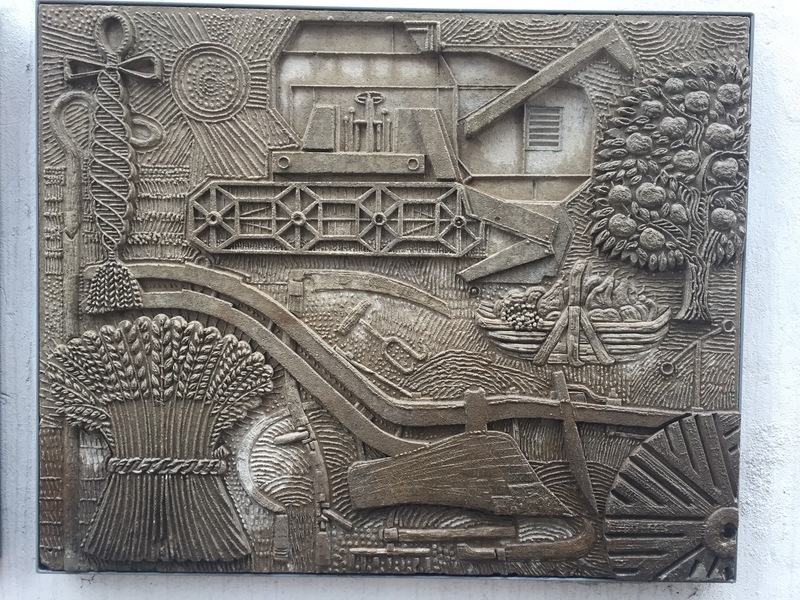 The couple worked with Hutton Builders in Birch, Colchester whose expert knowledge of decorative concrete led to a long partnership and they worked with the artists on all their concrete murals across the UK. 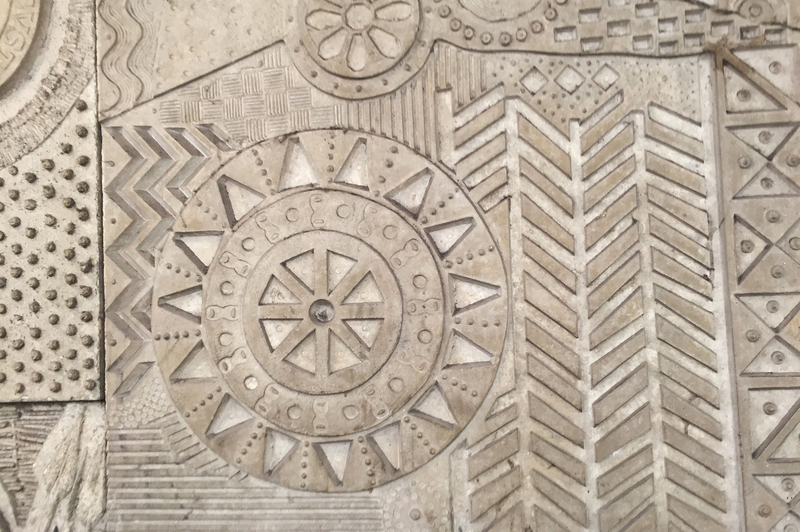 They made the panels in pre-cast concrete, developing their designs in reverse and pouring concrete into moulds. These were initially made in polysterene which would then be broken to remove the concrete mural panel. Later the couple designed wooden moulds with a releasing agent enabling the moulds to be used again. 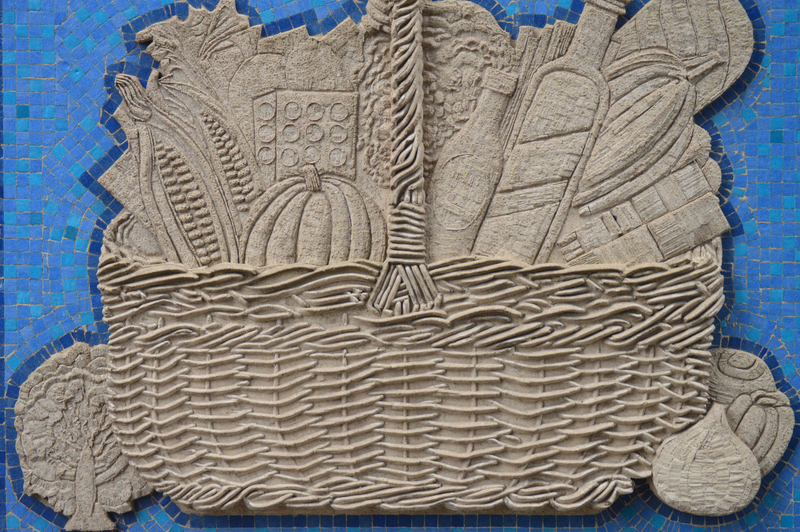 Each commission was unique though they made a repeated motif for regular clients – for example – for Sainsbury’s they used a sun or wheel panel design and for BHS a basket of food. Sainsbury’s led the way for commissions by other companies including British Home Stores, IBM and Philips. 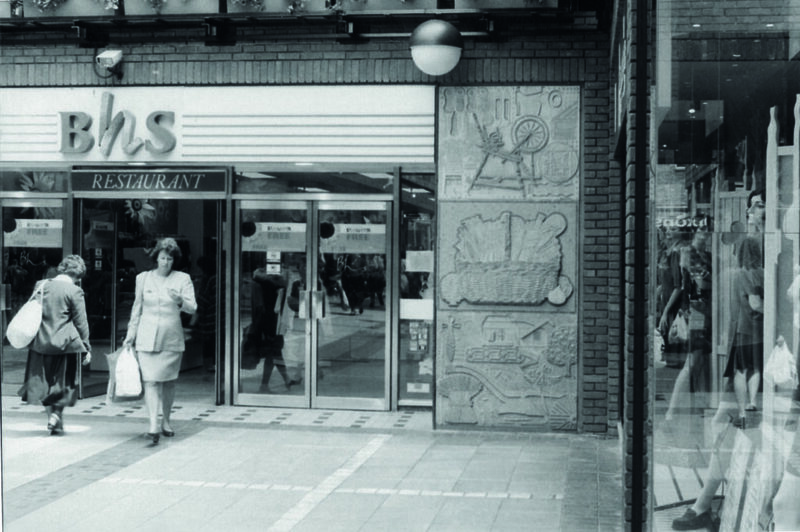 British Homes Stores in Colchester commissioned the couple to make a mural in 1976. This was part of the store’s entrance for over 30 years until it was removed for restoration of the shopping centre. In 2011, Firstsite, Colchester’s art gallery led the restoration and re-siting of these works and they can now be seen on the façade of 15 Queen Street.